After receiving her well deserved 11th Grammy nomination, Jazmine Sullivan continues to wow fans with her stunning rendition of The National Anthem at the Coors Light Stadium Series ice hockey match-up between the Minnesota Wild and Chicago Blackhawks. 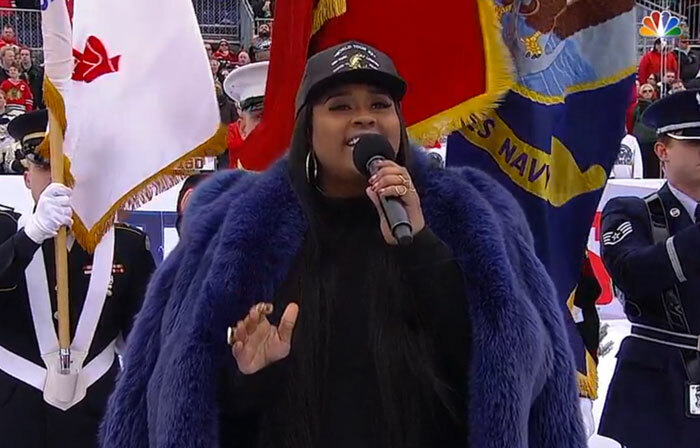 This past Sunday Jazmine Sullivan took to the stadium rocking all black and a deep purple fur coat to effortlessly belt out The Star-Spangled Banner. Amazing, check her performance out below! At this years Grammy Awards, Jazmine was nominated for three Grammys Best R&B Album, Best R&B Song, and Best Traditional R&B Performance.